Once you know how to measure your pulley, shop for the right one on our site get 10% off your order - Promo code is at the end of this article! 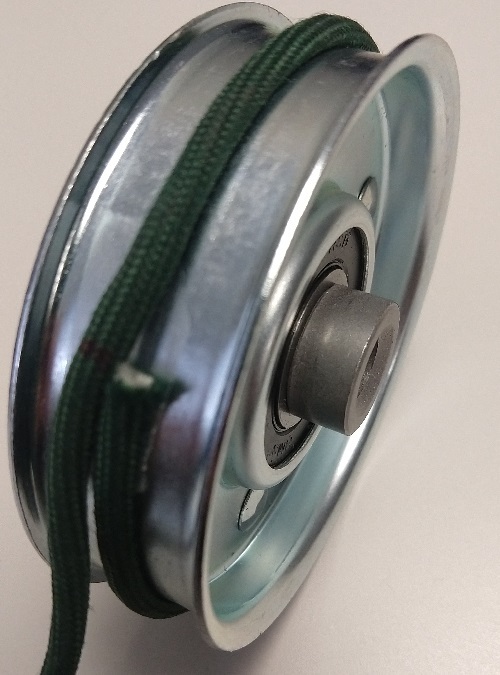 How Do I Measure My Pulley and Find the Right One To Buy? The most common measurements used to find the right pulley or sheave are the outside diameter, inside diameter and the width. There are also a few other measurements that are helpful to know in order to find the right size pulley or sheave for your needs. It's important to us that you can find a pulley that matches your specs as closely as possible - which may seem tricky when shopping online but here at Phoenix Pulleys, Bearings & Belts - we make it easy for you to find the right pulley and we offer Fast & Free Shipping on nearly all of our items! Below we explain how to measure various dimensions so you can find the right pulley and get it quickly! Note: We will be referring to "pulleys" going forward - but this information can be used for "sheaves" as well. These terms are often used interchangeably - to us sheaves are pulleys and pulleys are sheaves. Place your pulley face down on a flat surface, then put your ruler or caliper on top, measure from outside edge to outside edge across the circle of the pulley. Check carefully to make sure you are measuring across the center. 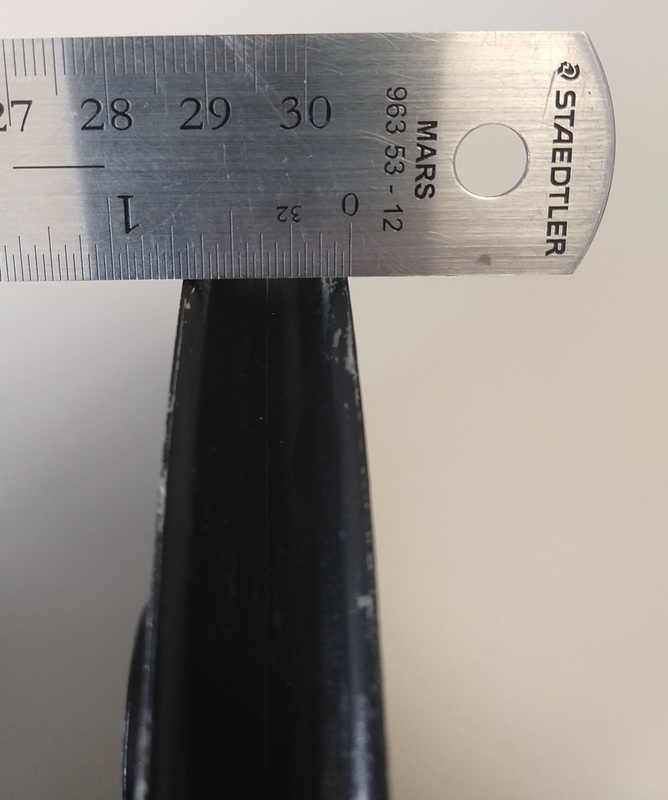 One trick is to hold one side of your ruler still and rotate the outside edge around - the outside diameter is always going to be the longest dimension you measure. To find a drive pulley based on the Outside Diameter, click FIND A DRIVE PULLEY and use the Outside Diameter filters on the left-hand side of the page to find the right size! You can also find V-Groove Idler Pulleys the same way by clicking FIND A V-GROOVE IDLER PULLEY. NOTE: If you have a Flat Idler - you may want to locate the right size based on the Flat Diameter instead of the total Outside Diameter. If you have a flat idler, check out the next section! You only need to get this measurement if you are using a flat idler pulley. This is the diameter of the pulley where the belt rides. If your flat idler does not have flanges keeping the belt in place, then the Flat Diameter will be exactly the same as the Outside Diameter. However, if your pulley has flanges, your flat diameter will be smaller than your outside diameter. 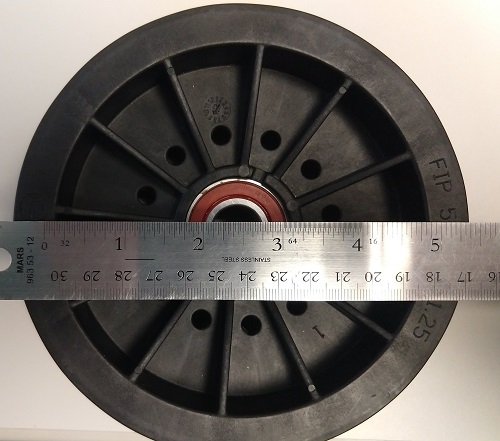 If your flat idler does have flanges, you can try and "guesstimate" the flat diameter by measuring the diameter the same as you would the outside diameter, just try to measure as if the pulley does not have flanges. Looks like this one's about 5"
To be more precise, you can wrap a string tightly around the flat of the pulley where your belt rides. Mark the string where they overlap, then measure its length. Divide that number by 3.14. In this flat idler, the string measured 10 1/4''. Typing 10.25÷3.14 into a calculator gets you 3.26, so the flat diameter is about 3 1/4”. No calculator on hand? You can use your browser’s search bar! Measure from side to side across where your belt sits, from outside edge to outside edge. The width dimensions on our site do not include the hub of your pulley. This dimension is only needed for measuring flat idlers and drives. Calipers work best for measuring this dimension. If you don’t have calipers, you will need to measure the width between flanges from inside edge to inside edge using a ruler and eyeballing it. If your pulley has flanges, the flat width will always be narrower than the overall width. Some flat idlers have a wide angle on their flanges – this helps your belt last longer, but does make it even trickier to measure accurately. Is this being used as a backside idler? Try also checking the widest part of your belt. If it’s a 5L or B belt, for example, then the flat of your pulley will need to be about 7/8” or bigger. Left: A ruler is used to measure the flat width. Center: Even inexpensive calipers can make measuring your parts so much easier. Far Right: A pulley being used as a backside idler. The flat side of the belt is making contact with the flat surface of the flat idler. Also Known As: Bore, center hole, bolt size, shaft size. Measure across the center hole of your pulley. Do not include any keyway in your measurement. 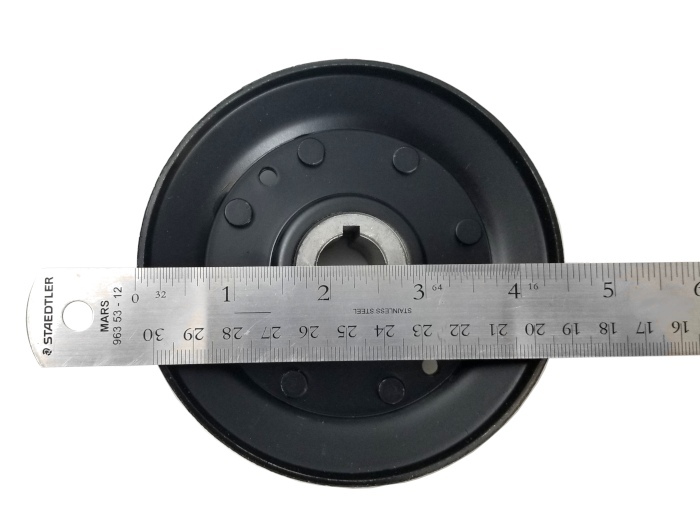 This pulley has an inside diameter of 3/4"
If you know your drive pulley is running on a 1" shaft, or that your idler pulley uses 3/8" bolts, then it's safe to assume that the inside diameter is the same as the shaft or bolt diameter. To find the pulley with the right inside diameter, click on either the drive pulley or idler pulley link below and then filter to the desired inside diameter on the left-hand side of the product page. The offset is the distance from the centerline of the pulley to the outside edge of the bore. On a V-groove drive, for instance, the centerline or “middle” of a pulley would be the lowest point of the V, and you would measure from there to the edge of the hub. Generally, the “frontside offset” is the longer of these dimensions, while the “backside offset” is the shorter. This is tricky to get if you can’t cut your pulley in half, so the good news is you probably won’t need it. A keyway is a notch made into the hub from the inside hole of a drive pulley and is where your key will be inserted to lock the pulley in place on the shaft. Most keyways are standardized to the shaft your drive pulley goes onto. If you have your key on hand, measuring that is certainly the most precise option. Otherwise, a ruler works fine. In the pulley world, a “pin” is a precisely-cut cylinder that links to the engineering standards of a specific belt type. During the design process, pulleys are “married” to a pin size which will be used in design processes for new equipment. 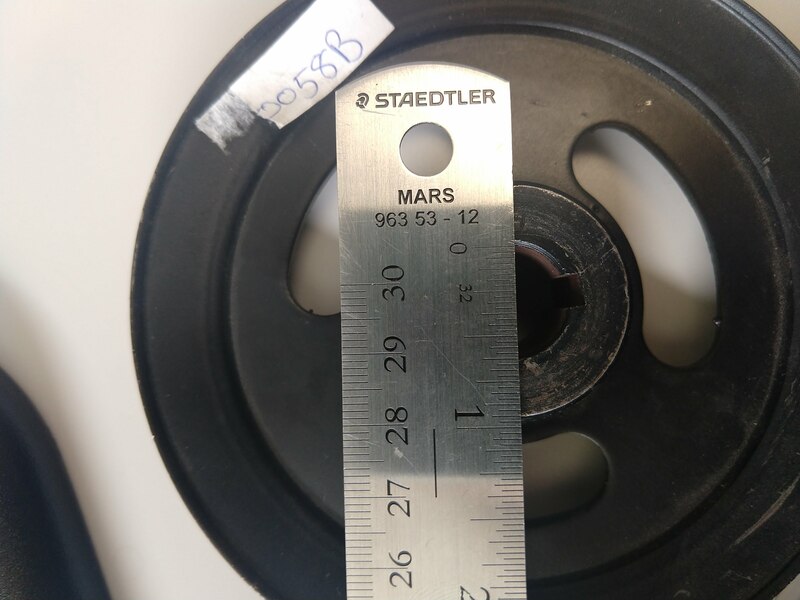 IMPORTANT: Having a pin diameter of 0.5625" does not mean that a 4L belt will not work, it just means that the pulley was not necessarily designed with that belt type in the mind of the engineer. Check in the “Belts that fit” section to see if your belt is listed on the pulley you are considering. If you place two pins on either side of the grooves on a v-belt pulley and measure the distance, you will get the Overpin diameter. How you can use this, though, is a tool to visualize how far into a groove your belt might ride into the v-belt pulley you’re considering. For instance, if the Outside Diameter is 7”, but the Overpin Diameter shows 7.35” then the belt is riding at the top of that pulley. Look at another 7” pulley, and the overpin shows 6.5. Now we’re looking at a belt that rides pretty deep into that groove. The diameter of the belt in the groove is also known as the "pitch diameter"
In a 7" pulley with this kind of groove, a 3L belt has a pin diameter of 6", while a 5L belt is at 6.8". If your original 3L belt was riding higher up in the groove of your original 7" pulley, then using a pulley with a 0.5625" pin will give your belt some slack that you might not want. A neat rule-of-thumb to try is that you can subtract one "pin diameter" from the overpin diameter, to get the "datum," or the estimate for where the center of the belt should ride. Note: Some places use "stickout" as a synonym of Offset, we find that to be less useful. How far does your bore “stick out” from the edge of your pulley? Place the pulley face down, with the longest part of the bore resting on the table. One of the easiest things to measure, so long as your ruler's marks go all the way to the edge instead of stopping early. Place your pulley, longer part of the bore pointed down, and measure from the table to outside edge of the pulley’s flange. The pulley all the way to the right has a "negative stickout" which means the bore doesn't even reach the edge of the pulley. The stickout is particularly useful for when you are bolting an idler up and don’t want the flanges to come into contact with anything. Measure from one end of your bore through to the other side. If you only have a thick ruler, try using a toothpick or pencil. When you have a negative stickout, you can't just put your pulley down on a table and successfully obtain a throughbore, so make sure to check the back side. BONUS: Ready to find that pulley? Enjoy 10% off your first order by entering promo code MEASURE at checkout!! Did we miss anything? Still confused? Email us at sales@phoenix-mfg.com or call 1-800-776-9315 - our team of experts is happy to help!